Perspective view of the overlapping spreading center discontinuity at 9°03'N along the East Pacific Rise. View is looking north along the ridge axis. 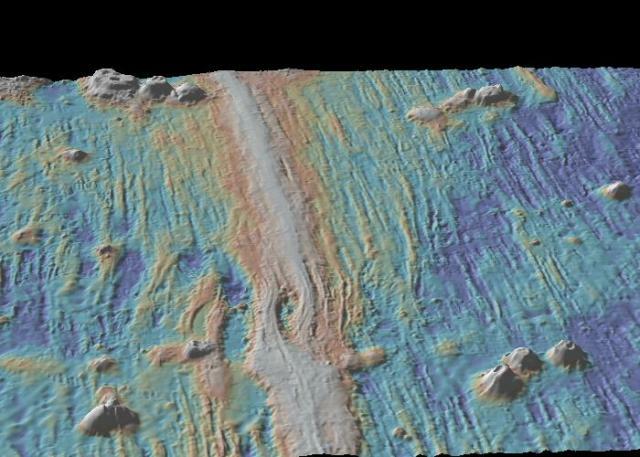 Image shows the v-shaped zone of disturbed seafloor left by the southward migration of this discontinuity over the past several million years. Former overlap basins and curved ridges are present on on the west flank of the ridge axis whereas a wide swath of deeper bathymetry and oblique trending faults are present on the east flank. Image made using GeoMapApp.